The slit lamp is a microscope that enables your optometrist to look closely at both the external and internal structures of your eyes. He or she will have you place your chin on the chin rest, then shine the lamp's light into your eye. This highly magnified view will reveal signs of infection or disease. 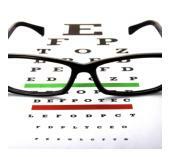 Aside from these procedures, your eye doctor may recommend that more specialized tests be performed. If you live in or around Brantford and you have any questions regarding your eye exam, please do not hesitate to contact us.